With Easter quickly approaching, we sat down to have a conversation with Jonathan Malm about how to welcome Easter visitors. 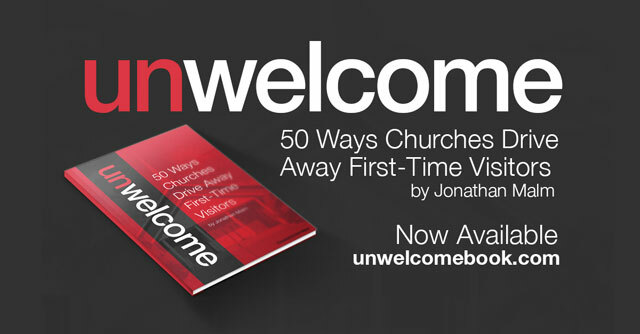 Jonathan is the author of multiple books, including Created For More: 30 Days to Seeing Your World in a New Way and our own Unwelcome: 50 Ways Churches Drive Away First-Time Visitors. Easter is a prime time for visitors. What are some specific issues churches need to be aware of when it comes to welcoming visitors at Easter? Jonathan Malm: I love Easter services. They have a certain buzz about them that you don’t see in an everyday service. This comes partially from a more full service. It comes partially because people arrive more expectant. Where Christmas has become mostly about presents and stress, Easter is still a fairly untainted holiday. Church people realize it’s about the death and resurrection of Jesus. The first-time visitor shouldn’t feel singled out. They should feel like they’re at home. That creates a weird dynamic, though. Your regulars are creating one energy—confidence. While your visitors are unsure—because they’ve either never set foot in your building or haven’t been there in a year. It’s important you prepare for this hoard of lost people in your services. You need to refresh your volunteers on all their training and make sure they’re ready for people who have no idea what to do at church. The first-time visitor shouldn’t feel singled out. They should feel like they’re at home. Connect what you have to offer in your services with what people feel like they need. With so many people coming to church just for Easter, how do you get them to come back? Jonathan: I think there are two important things to realize for this question.The first, is that Easter is a chance to show people what your church is like. Unfortunately, it’s also one of the times we tend to do things we don’t normally do. We have things like cantatas or dramas. A visitor, coming to your church for the first time, might easily think this is the norm. I wouldn’t want to attend a cantata or drama each week… I’d want to attend a church. Let people know what they can expect when they come back. Church visitors don’t want to feel singled out, but they want to feel valued. What are visitors looking for at Easter? At Christmas we understand that tradition is important, but what draws visitors to a specific church for Easter? Jonathan: In a country that has a very strong Christian history, there’s still a tradition where people want to go to church on Easter. It’s kind of similar to liking the band U2: even if you don’t really enjoy their music, you’re just supposed to like U2. It’s just an expectation. So people are looking for a church service. They want to hear the story of Jesus and they want to sing some songs. Meet them where they are, then delight them with someone unexpected. They don’t want to feel singled out, but they want to feel valued. They don’t want to feel judged, but they want to hear the truth. They want you to speak their language, and they want to be able to understand. Create an amazing experience for children and they’ll want to come back. Easter egg hunts: Harmless fun for the kids? Wonderful resurrection metaphor? Or another holiday culture clash; Jesus vs. the Easter Bunny? Jonathan: The bottom line for kids is this: make sure they have a blast. McDonald’s has taught us that parents will go where their kids drag them. Create an amazing experience for children and they’ll want to come back. Whether that’s Easter Egg hunts or bounce houses. If you’re convicted about Easter egg hunts, don’t do them. But you also don’t have to speak out against them. The strongest message we can send to the world is what we’re for…not what we’re against. Be for fun. Be for life. Be for love. People are taking small steps and seeing results in their services by making people feel more welcome. Unwelcome has been out for a few months now. What kind of feedback are you getting? Are there any visitor topics that didn’t get covered in the book and you wish you did? Jonathan: Sometimes we simply forget to tell guests we want them there. We may send out a mailer telling people about a new sermon series, but we forget to tell people we want them to show up. Churches can feel like social clubs sometimes, and social clubs tend not to be the most welcoming. I’ve even felt this at coffee shops before. You walk in for the first time and the baristas and regulars look at you like you aren’t supposed to be there. It’s scary. And that’s what many people assume will happen when they walk into a church for the first time. Using verbiage and positioning your first impressions team to combat that is a good first step. Sometimes we simply forget to tell guests we want them there.